I was reminded this morning that I have forgotten how to breathe. Not in the OMG I’m not going to suffocate and die at this moment way, but that somehow I’ve forgotten how to breathe into my peace and bliss. Sometimes I get so caught up in life, running around trying to put out fires, that I forget that one of the best things I can do for myself is to just stop and breathe. Slowly, deeply, inhaling that healing breath. It never ceases to amaze me what an immediate difference that makes to my nervous system. I was doing the first of the new series of Healing Light Yoga Therapy classes lead by my friend and mentor Asrael. I have done every series she has offered so far and it has been such an important part of my healing journey. It surprised me (although it shouldn’t have) all the emotions that were brought up for me in that class. This journey I’ve been on has been about embracing happiness, but there’s many more emotions attached to it as well. Part of finding happiness for me has meant that I also have been able to acknowledge that other emotions flow through me – anger, sadness, grief, anxiety – and that they all need to be honoured. I never really knew what to do with those feelings so I would just stuff them deep down where they would fester and damage me. Now, I can allow them into my life and still know that I’m a happiness seeker because… well… those other emotions are part of life too. Today’s special visitors were sadness and grief. Those are ones that I’ve worked very hard at pushing away. The past few years have had so much loss in them. On top of losing my dad, I’ve had to give up the dream I wanted for my family. There’s a lot of good that is coming from that, but it still carries so much pain and sorrow that my kids won’t have the family I dreamed for them and neither will I. I’ve already grieved losing that person, but the sadness from giving up that dream still sneaks up on me. This type of yoga helps all of those emotions move out of my body. It’s tiring, but so healing. I seem to keep coming back to discovering the gifts that God has given me and figuring out what I am supposed to do with them. Understanding that I need to listen very carefully to my heart and my intuition is going to guide me along the path of this part of my life. That is being told to me very clearly in everything I do lately. It was a beautiful, sad, blissful, grieving, peaceful happiness moment as I worked at embracing my light this morning in my yoga class. 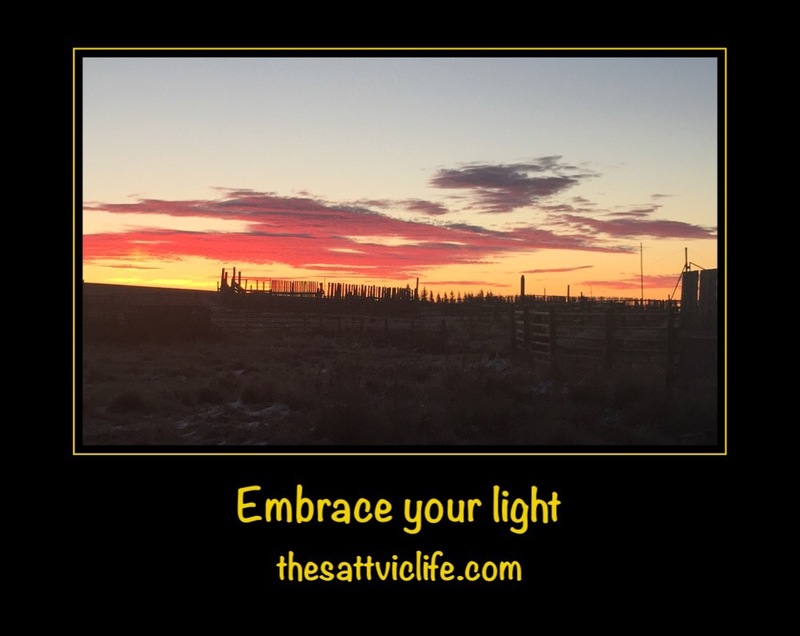 We all have this light we need to shine into the world. I feel like I’m finally finding mine.